The present study aims to evaluate the cost-effectiveness of the newly introduced varicella and herpes zoster (HZ) vaccination programmes in Italy. The appropriateness of the introduction of the varicella vaccine is highly debated because of concerns about the consequences on HZ epidemiology and the expected increase in the number of severe cases in case of suboptimal coverage levels. We performed a cost-utility analysis based on a stochastic individual-based model that considers realistic demographic processes and two different underlying mechanisms of exogenous boosting (temporary and progressive immunity). Routine varicella vaccination is given with a two-dose schedule (15 months, 5–6 years). The HZ vaccine is offered to the elderly (65 years), either alone or in combination with an initial catch-up campaign (66–75 years). The main outcome measures are averted cases and deaths, costs per quality-adjusted life years gained, incremental cost-effectiveness ratios, and net monetary benefits associated with the different vaccination policies. Demographic processes have contributed to shaping varicella and HZ epidemiology over the years, decreasing varicella circulation and increasing the incidence of HZ. The recent introduction of varicella vaccination in Italy is expected to produce an enduring reduction in varicella incidence and, indirectly, a further increase of HZ incidence in the first decades, followed by a significant reduction in the long term. However, the concurrent introduction of routine HZ vaccination at 65 years of age is expected to mitigate this increase and, in the longer run, to reduce HZ burden to its minimum. From an economic perspective, all the considered policies are cost-effective, with the exception of varicella vaccination alone when considering a time horizon of 50 years. These results are robust to parameter uncertainties, to the two different hypotheses on the mechanism driving exogenous boosting, and to different demographic projection scenarios. The recent introduction of a combined varicella and HZ vaccination programme in Italy will produce significant reductions in the burden of both diseases and is found to be a cost-effective policy. This programme will counterbalance the increasing trend of zoster incidence purely due to demographic processes. Varicella zoster virus (VZV) is a DNA virus belonging to the Herpesviridae family that affects only humans. Infection by VZV can result in two distinct diseases: varicella or chickenpox, which is a highly communicable and widespread childhood disease, and herpes zoster (HZ) or shingles, caused by the reactivation of VZV, which remains latent in the dorsal root ganglia after primary varicella infection. Although it is usually a mild disease with a relatively low percentage of complications, especially when occurring in immunocompetent children, varicella is highly contagious and may lead to more severe consequences and disabling symptoms in adults. Reactivation of the virus, usually occurring in the elderly or immunocompromised patients, leads to HZ infection. This is characterised by a vesicular eruption along the course of the nerve and is commonly associated with pain. Complications of HZ occur in up to 20% of the cases among those aged 50 or older, with post-herpetic neuralgia (PHN) being the most common, persistent, and intractable chronic sequela [1, 2]. A live attenuated vaccine against varicella was developed in 1974 and introduced in some countries starting from 1995 . In Italy, eight regions (Apulia, Basilicata, Calabria, Sardinia, Sicily, Tuscany, Veneto, and Friuli-Venezia Giulia) have gradually introduced childhood varicella vaccine into their immunisation programmes starting in 2003, in children aged 13–15 months and 5–6 years . Since 2017, a two-dose schedule has been introduced nationally for all newborns as one of the ten vaccines (hexavalent, plus measles, mumps, rubella, and varicella) that have become compulsory for school attendance . Nonetheless, in many developed countries, the introduction of varicella vaccination into the national schedule still represents an ongoing open discussion. Indeed, VZV mass immunisation would reduce varicella circulation, but it may potentially increase the incidence of more severe varicella cases among adults  and reduce the partial protection against HZ provided by VZV re-exposure (called “exogenous boosting”), thus increasing HZ incidence . Results from HZ surveillance programmes in countries that have introduced VZV mass immunisation do not provide univocal evidence. Some countries detected an increase in HZ incidence following mass immunisation, while others did not observe any effect on it [8, 9]. Conversely, an increase in HZ incidence has been reported in the past decades across various countries before the introduction of varicella vaccination programmes . This pattern appears consistent with results from modelling work that showed that past demographic changes and, in particular, the ageing of the population may have generated the remarkable growth of HZ incidence observed in Spain between 1997 and 2004, before the introduction of the varicella vaccination programme . A live attenuated vaccine against HZ was licenced in 2006 [12, 13], and so far has been recommended in some countries, either in combination with the varicella vaccination (e.g. in the USA and recently in Italy) or alone (e.g. in France and the UK), making the evaluation of post-vaccination trends even more complex. Previous transmission models of VZV infection suggested an increase in HZ incidence as a consequence of the reduction of exogenous boosting associated with varicella vaccination. However, the magnitude of this increase depends on modelling assumptions on the mechanism of VZV reactivation [14–19], whose biology has not yet been elucidated [20–25]. The cost-effectiveness analysis here is performed under two different assumptions regarding the mechanism of VZV reactivation. The first assumption, which has been widely adopted in past modelling approaches, hypothesises temporary complete immunity to HZ following re-exposure to VZV . The second assumption relies instead on the explicit modelling of the development of a progressive partial immunity to HZ following each re-exposure to VZV, which better reflects the biological mechanisms driving the exogenous boosting . So far, models including the latter mechanism have provided a better fit to the age-specific profile of HZ incidence in several countries , Italy included . Also, the cost-effectiveness of varicella vaccination programmes was shown to be highly dependent on the assumptions about the boosting mechanism [27, 28]. Varicella vaccination appeared cost-effective when the model excluded the effect of boosting on the epidemiology of HZ [27, 29]. Conversely, when the latter effect was included, the cost-effectiveness of the programme became questionable, due to detrimental effects of varicella vaccination on HZ in the short and the medium term [30, 31]. The aim of this work is to provide a thorough evaluation of the expected effectiveness and cost-effectiveness of the recently introduced Italian varicella and HZ vaccination programme. For this purpose, a stochastic individual-based model (IBM) will be used, developed considering the observed demographic processes (such as the decline of fertility). Alternative immunisation strategies will be considered, and the sensitivity of our results to the two different assumptions about the exogenous boosting will be assessed. In this study, we use a stochastic IBM for VZV transmission and reactivation in Italy, informed with historical demographic data and available demographic projections [32, 33] and calibrated on the age-specific varicella serological profile and age-specific HZ incidence. The proposed modelling approach is similar to that adopted to investigate historical epidemiological trends of measles across different countries and varicella in Spain [11, 34, 35]. The model is used to assess the economic impact of different varicella and HZ vaccination strategies on the future epidemiology of the two diseases through a cost-effectiveness analysis. Details of the demographic and epidemiological data used to parameterise the model are provided in Additional file 1: Figures S1 and S4. We consider two epidemiological models, which differ in the assumption made to model the mechanism driving exogenous boosting and VZV reactivation , denoted respectively as progressive immunity (PI) and temporary immunity (TI) [16, 18]. The structures of the corresponding models are shown in Additional file 1: Figures S2 and S3. In both models, maternal antibodies confer protection against varicella infection to newborn babies for 6 months on average, after which children become susceptible to natural VZV (i.e. wild-type) infection. Susceptible individuals are exposed to a time- and age-dependent force of infection. After recovery, varicella-infected individuals acquire lifelong immunity against varicella. The generation time of varicella infection is assumed to be 3 weeks on average. In model PI, after recovery from varicella, individuals become susceptible to HZ. The rate of VZV reactivation decreases with the number of re-exposures to VZV, while it increases with both the time elapsed since the last re-exposure and the individual’s age . In model TI, individuals who recover from varicella acquire temporary full protection against HZ, and the VZV reactivation rate only depends on the individual’s age . In both models, HZ-susceptible individuals may either develop HZ, acquiring, after recovery, lifelong immunity to HZ disease, or they can be boosted through VZV re-exposure. In model PI, each boosting event progressively reduces the risk of VZV reactivation into HZ, whereas in model TI, it provides a temporary complete protection against HZ development. In both models, we assume that only a fraction of contacts with VZV-infected individuals results in an effective boosting event . Epidemiological parameters of both models' structures are provided in the Additional file 1: Table S1 and S2. Varicella vaccine is administered in our models starting from the year 2017. Vaccinated individuals either develop lifelong protection against varicella or they undergo vaccine failure. In the latter case, they remain susceptible to VZV and may experience a milder varicella infection, called “breakthrough varicella”. Although individuals infected with breakthrough varicella can transmit the virus, they are assumed to be half as contagious as natural varicella cases . Under model PI, individuals who have recovered from breakthrough varicella become susceptible to HZ, whereas under model TI, they become temporarily immune against HZ. In both models, varicella vaccinated individuals can develop HZ, either after recovery from varicella breakthrough or directly from the vaccine strain, or can experience boosting. The VZV reactivation rate for varicella vaccinated individuals is lower than for those who experienced natural varicella . Individuals successfully vaccinated against HZ acquire lifelong immunity to VZV reactivation, whereas those experiencing HZ vaccine failure remain susceptible to HZ. Five different vaccination scenarios are considered and compared in an incremental cost-effectiveness analysis. The case of no intervention is also explored to assess the expected evolution of varicella and HZ epidemiology as driven by the changing demography only, had vaccination not been introduced. Following the new Italian National Immunisation Plan (NIP) 2017–2019 , we implement a routine varicella vaccination programme with a two-dose schedule (first dose at 15 months of age, second dose at 5–6 years of age) and an HZ vaccination programme with the live attenuated vaccine, targeted at individuals who are 65 years old. The two policies are evaluated either as single strategies or in combination. In addition, we also evaluate the effects of a catch-up campaign with the HZ vaccine targeting 66- to 75-year-old individuals. The resulting five programmes are the following: (1) routine varicella vaccination (VR), (2) routine HZ vaccination (HZR), (3) routine HZ vaccination with HZ catch-up campaign (HZR + CU), (4) routine varicella and HZ vaccinations (VRHZR), and (5) routine varicella and HZ vaccinations with HZ catch-up campaign (VRHZR + CU). Base case coverage levels for varicella and HZ vaccination are assumed to be equal to 80% and 60%, respectively. The vaccine efficacy per dose is set to 80% for the varicella vaccine, which implies an efficacy of 96% after two doses , while it is set to 50% for one dose of HZ vaccine . The efficacy of varicella vaccine only refers to the protection against VZV infection. This means that a larger efficacy for the varicella vaccine generates in our model a larger proportion of individuals not developing varicella. Finally, demographic changes are simulated in the period 2015–2100 as informed by temporal variations of the crude birth and age-specific mortality rates provided by the United Nations in the 2015 World Population Prospects . 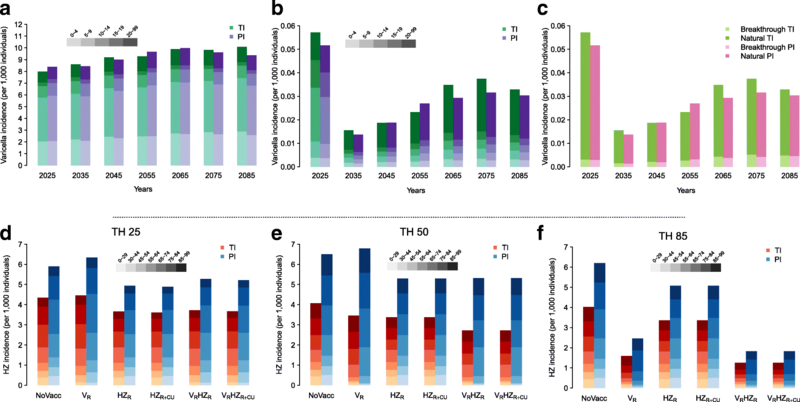 The calibration of the models was carried out using Monte Carlo Markov chain (MCMC) methods applied to the binomial likelihood of the VZV seroprevalence profile in 1996–1997  and to the Poisson likelihood of the age-specific HZ incidence in 2004 (Additional file 1: Figure S4) . We calculated 95% prediction intervals (PIs) for the model-based estimates. More details are provided in Additional file 1 where the robustness of our results is assessed (Figures S5 and S6). Modelling and data analyses were conducted in C and R.
Cost-effectiveness analysis is applied to the outcomes of the epidemiological model, and quality-adjusted life years (QALYs) gained are used to evaluate the impact of different policies in terms of reduction of disease burden. Varicella cases are differentiated between natural infection and breakthrough cases, as the latter are expected to incur lower QALY losses and generate lower costs (Additional file 1: Figure S11). For HZ, we distinguish between cases that develop post-herpetic neuralgia (PHN) and those that do not, as costs and benefits for the two conditions are expected to differ (Additional file 1: Figure S12). We consider both the direct costs of disease (general practitioner (GP) visits, treatment, and hospitalisation) and the costs of the vaccination programmes. We report on the effects of the different policies on varicella and HZ, in terms of both burden of illness (averted cases and deaths, by disease) and economic and quality of life impact (QALY gained ∆E, and net costs ∆C). Cost-effectiveness outcomes are produced under the taxpayer perspective and evaluated at three different time horizons (TH = 25, 50, 85 years), assuming discount rates of either 3% or 0% per year for both future health benefits and costs. The 3% discount rate puts less weight on the cases predicted in the long term, while the 0% discount rate weighs cases at a greater distance in time as much as those closer to the origin. We perform an incremental cost-effectiveness analysis to determine, for each model and time horizon, which policies are deemed cost-effective, using both the incremental cost-effectiveness ratio (ICER, computed as ∆C/∆E) and the net monetary benefit (NMB, computed as t∆E − ∆C), where the threshold t represents the opportunity cost of an additional QALY gained. We consider two possible cost-effectiveness (CE) thresholds t, one demand-based of 40,000 EUR , and one supply-based of 15,000 EUR . The former threshold represents the dominating approach in all health care systems, including those in Italy , and it depends on how individuals value health compared to other types of consumptions. The latter, based on the estimated marginal productivity of the health care system, represents a direct measure of the health consequence of changes in the allocation of the available resources . A sensitivity analysis is conducted to assess how cost-effectiveness analysis results change when assuming different values of the CE threshold t.
The base case analysis considers 1000 model realisations of varicella and HZ cases by age and over time, generated under the strategies under investigation. These are combined with the base case values of the economic and quality of life parameters (Tables 1 and 2). The robustness of model results to uncertainty in model parameters is assessed through a probabilistic sensitivity analysis (PSA) , where, using an empirical Bayesian approach, the prior distributions for the model parameters are either grounded on the respective base case values or are set by assuming little or no information about the parameters of interest (e.g. when any estimate of the variability of the parameter is not available) . For evaluating the effects of the uncertainty around both epidemiological estimates and economic model parameters, we compute the NMB associated with 1000 different parameter sets, sample from their posterior distribution, and derive 95% credible intervals (CIs) from their posterior distribution. The uncertainty around the choice of the optimal strategy (i.e. 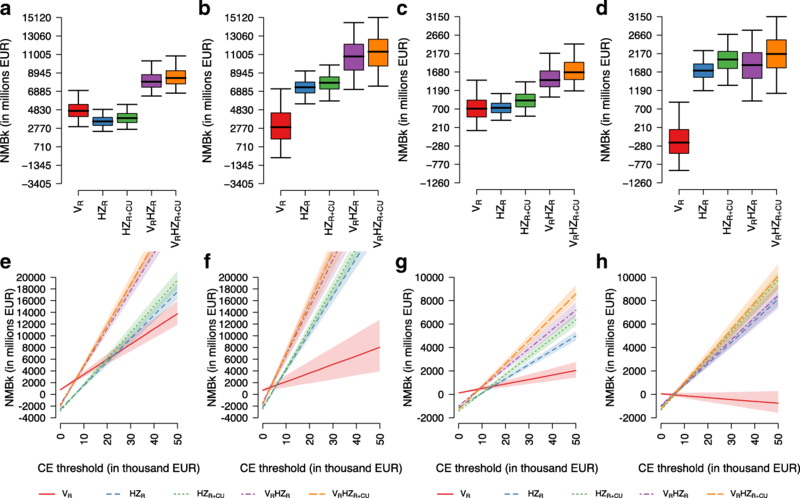 generating the highest NMB), under both discount rates of 0% and 3%, is represented with (1) box plots of the posterior distribution of the NMB and (2) net benefit charts showing how the median NMB changes for a variety of values of the CE threshold . Finally, six additional scenarios under the PSA are evaluated to assess the sensitivity of our results to (1) two different coverage levels of varicella vaccination (70%, 95%), (2) two extreme assumptions on the role of exogenous boosting (assuming either low or high reduction of the HZ risk due to VZV re-exposure), and (3) two different demographic scenarios on the total fertility rate in the future (a lower and a higher crude birth rate). Under the no vaccination scenario, both model structures predict a stable overall incidence of varicella over time (Fig. 1a), as well as an increase in HZ rate, which will stabilise only after some decades (Fig. 1d–f and Fig. 2). This growth can be ascribed to two factors, i.e. the population ageing that acts equally in both models, and the delayed effect, stronger for model PI, of the decline in the fertility rate which occurred during the last century on the individual risk of HZ development. Indeed, the decline of fertility in the past reduced both varicella circulation and the frequency of VZV re-exposure. In particular, during the period 2017–2100, model TI forecasts a peak in the total HZ incidence of about 15.1% (95% PI 8.1–22.3%) with respect to 2017 and a stable incidence level in the long term that is 2.6% (95% PI –5.2 to 10.9%) higher than in 2017. On the other hand, model PI forecasts a peak in HZ incidence with respect to 2017 that amounts to 61.4% (95% PI 44.9–77.1%) and a stable incidence level in the long term that is 48.3% (95% PI 33.4–62.8%) higher than in 2017 (Fig. 2). The recently introduced combined varicella and zoster vaccination strategy (VRHZR), at baseline coverage levels of 80% and 60%, respectively, is expected to produce a sudden and enduring reduction in varicella incidence as well as a significant increase in the average age at varicella infection (Fig. 1b). Moreover, although in the short and the medium term the current programme might provide an increase in HZ incidence compared to the pre-vaccination level (though still lower than under the no vaccination scenario), in the long term it is expected to reduce the burden of HZ disease in Italy to its minimum, with small differences between the two models (Fig. 1d–f and Fig. 2, Additional file 1: Figures S9 and S10). In particular, we expect a reduction of 70.7% (95% PI 34.7–91.5%) in HZ incidence with respect to the no vaccination scenario under model PI, and of 68.6% (95% PI 61.8–74.1%) under model TI (Fig. 1f), with an upwards shift in the average age at VZV reactivation into HZ. Indeed, for both models, while the age group that is mostly affected by HZ in 2017 is 55–64 years (accounting on average for 21.1% and 20.3% of the total cases in models PI and TI, respectively), in the long term the models forecast that most cases would occur in the age group 75–84 under model PI (40% on average) and in the age group 85–99 under model TI (26.8% on average). Nonetheless, the overall reduction in HZ incidence obtained with the combined programme (VRHZR) implies a much lower cumulative number of HZ cases and HZ-related deaths than those expected with no vaccination, under any time horizon (Additional file 1: Tables S3 and S4, with 3% and 0% discount rates, respectively). The effect of the introduction of a varicella vaccination policy alone (VR) on natural HZ incidence in the short and the medium term strongly depends on the model considered. In the first decades after introduction, no evident variation with respect to the no vaccination scenario is expected under model TI, whereas a 15% increase of HZ incidence is estimated under model PI (Fig. 2). In the long term, since varicella vaccination would reduce the replacement of the HZ-susceptible individuals generated by natural varicella, we would find that HZ incidence is less than half of that expected under no vaccination (Fig. 1f), with levels even lower than those in the pre-vaccination period (Fig. 2). Conversely, a routine HZ vaccination programme would mitigate the increase of HZ incidence both in the absence (HZR) and in the presence of varicella vaccination (VRHZR), in both the short and the medium term. However, the policy including only HZ vaccination would not affect the replacement of the HZ-susceptible individuals caused by varicella infection, and therefore result in the long term in a much higher level of HZ incidence than that achieved through policy VR (Fig. 1f). Indeed, according to model PI, in the long term, VR and HZR would respectively lead to a 60.6% (95% PI 12.6–88.2%) and an 18.1% (95% PI 15.9%–20.4%) reduction in HZ incidence with respect to no vaccination (although the undiscounted cumulative number of zoster cases remains slightly higher under policy VR (Additional file 1: Table S4). Under both models and time horizons (except for TH = 50 under the PI model) and assuming a discount rate of 3%, we found the combined policy with varicella vaccination and HZ vaccination with catch-up (VRHZR + CU) to be the most cost-effective in terms of ICER and NMB, no matter what the chosen threshold (Table 3). However, for TH = 50 years and when considering model PI, the most cost-effective policy remains the one with the HZ vaccination and catch-up campaign (HZR + CU) (Table 3). Varicella vaccination alone (VR) was never found to perform better than the other strategies, even though it strongly dominated the no vaccination scenario under model TI, resulting in cost savings in the medium and in the long term (Table 3). Conversely, VR performed worse under model PI, where it turned out to be always dominated and even generated QALY losses in the medium and in the long term as a consequence of the increase in cumulative HZ cases in the first decades following the introduction of vaccination (Additional file 1: Table S3). Similar conclusions can be drawn when considering a discount rate of 0% (Additional file 1: Table S4). Also with undiscounted values, we found the combined policy VRHZR + CU to be the most cost-effective for all models and time horizons, except for TH = 50 under model TI, where the policy HZR + CU was the most cost-effective (Additional file 1: Table S5). Under the PSA, we found that, for a CE threshold of 15,000 EUR, VR consistently underperforms compared to the other strategies, irrespective of the model used and the assumed discount rate. Its worst performance, with the NMB decreasing as the CE threshold increases, is expected under model PI with discount rate equal to 3%, because of the higher (negative) impact of varicella vaccination on HZ epidemiology (Fig. 3h). On the contrary, under model TI, VR always generates a strictly positive NMB, but it is always dominated by the other strategies, except for CE thresholds lower than 8000 EUR (Fig. 3g). Under both models, the combination of the two vaccinations, VRHZR and VRHZR + CU, maximises the NMBs when considering undiscounted outcomes (Fig. 3a and b), with the latter strategy being the most cost-effective above a CE threshold of 8000 EUR (Fig. 3e and f). However, when assuming a 3% discount rate, we find that, under model PI, the reductions in HZ incidence in the long term are not enough to counterbalance the short-term increase in HZ infections induced by varicella vaccination. Hence, the resulting NMB distribution of the combined programmes is quite similar to those generated by HZR and HZR + CU (Fig. 3d and h). In particular, increasing the CE threshold, the strategy VRHZR + CU converges to a probability of about 60% of being the most cost-effective, while the strategy HZR + CU converges to about 40% (Additional file 1: Figure S14D). This result shows that the introduction of an HZ catch-up programme for those aged 66–75 is always beneficial, as it usually produces an increase in the estimated NMB. Interestingly, we found that the input parameters for the epidemiological model, rather than those for the economic model, represented the most influential source of uncertainty on the posterior distribution of the NMB (Additional file 1: Figure S26 and Table S6). Remarkably, the obtained results are quite robust to variations in the varicella vaccination coverage levels, although upwards or downwards variations in the coverage generate, respectively, a decrease or an increase in the estimated NMBs (Additional file 1: Figures S15 and S16). When we assume a weaker boosting effect, i.e. a low reduction of the HZ risk due to VZV re-exposure, the distribution of the NMBs for the single HZ policies shifts downwards, and the combined policies VRHZR + CU and VRHZR outperform the single ones (Additional file 1: Figure S17). Conversely, by considering a stronger role of boosting, both combined policies (VRHZR and VRHZR + CU) underperform compared to those solely based on HZ vaccination (HZR and HZR + CU), while VR never proves cost-effective, even in the long term (Additional file 1: Figure S18). Considering the uncertainty in future demographic changes, scenarios assuming a higher future birth rate result in a higher varicella and a lower HZ incidence. However, under a high birth rate scenario, the population would also increase, leading to a higher number of HZ cases, despite the drop in the incidence. Nevertheless, in the long term, the results of the cost-effectiveness analysis are robust to the uncertainty in the demography, with the combined strategies generating the highest NMBs under both the low and the high birth rate scenarios (Additional file 1: Figures S23 and S24). The results of this study suggest that the recent introduction of the combined varicella and HZ vaccination programmes in Italy is expected to produce a significant reduction of the disease burden caused by VZV infection and reactivation in the long term. The new policy appears to be economically acceptable from a public health payer perspective under different model assumptions on the mechanism of exogenous boosting. In the base case analysis, under the progressive immunity (PI) model, we found that the combined programme would annually prevent, with respect to no vaccination, an average of 435,000 undiscounted cases of varicella, more than 77,000 cases of HZ, and 81 HZ-related deaths per year at a cost of 4375 EUR per QALY gained. Instead, under the temporary immunity (TI) model, we would predict a reduction of almost 437,000 varicella cases, 59,000 HZ cases, and 45 HZ-related deaths per year at a cost of 8170 EUR per QALY gained. From our modelling results, the projected impact would be further improved by adding an HZ catch-up campaign targeting persons 66–75 years old to the implemented national programme. The inclusion of this targeted immunisation activity could prevent on average 3542 additional cases of HZ and 6 deaths per year under model PI, or 3079 HZ cases and 5 deaths under model TI, always maximising the estimated NMB of the strategy. The NMBs are mostly sensitive to the uncertainty on epidemiological parameters, and the ICER values strongly depend on parameters related to HZ and PHN, such as the outpatient and inpatient costs and the corresponding QALY loss (Additional file 1: Figure S25). Overall results appeared robust to changes in model parameters and to different assumptions on exogenous boosting. However, when considering a post-vaccination time horizon of 25 years, varicella vaccination produced an increase in HZ incidence, the magnitude of which depended on whether we assumed a progressive or a temporary immunity model. Individual strategies were also evaluated, and model results showed that, whereas HZ vaccination is expected to cost-effectively reduce the burden of HZ disease, varicella vaccination would negatively impact the overall burden of VZV in the short and the medium term. Hence, the introduction of this strategy on its own would not be considered cost-effective from the health care payer perspective. The obtained results are relevant as they thoroughly evaluate the impact of these newly introduced vaccination programmes, taking into consideration all potential direct and indirect, both positive and negative, effects of the vaccines in Italy, exploring the current uncertainty on the mechanism, either temporary or progressive, underlying exogenous boosting. This latter aspect differentiates this study from previous work, where the cost-effectiveness was evaluated either considering no exogenous boosting or assuming a TI mechanism. In the former case, findings showed that varicella vaccination was always cost-effective (under the health payer perspective) or even cost-saving (under the societal perspective) [27, 29], while in the latter case, it was generally not cost-effective [30, 31] (except for France ), except when considering the long term [29, 48]. Moreover, the model also improves on the previous analyses in the way demographic processes are accommodated. Indeed, the model explicitly considers realistic changes in the Italian population age structure over time to take into account temporal trends in VZV epidemiology that are not directly ascribable to the immunisation programme, but rather to the ageing of the population and to the reduction in the expected number of susceptible children. A similar approach was also recently considered for modelling varicella and HZ epidemiology in Germany . In their study, the authors evaluated the effect of population ageing and migration flows on the epidemiology of the two diseases, along with vaccination policies, but they did not assess the cost-effectiveness and economic acceptability of the programmes. Our work is based on the underlying assumption of long-lasting protection induced by the HZ vaccine, which might appear to contrast with recent evidence of declining effectiveness (from 60 to 70% in the first years to 30 to 40% in the eighth year) . Although we acknowledge that this can be considered a limitation of our work, we believe that our assumption of a constant vaccine efficacy of 50% can be seen as an average level of protection throughout the observation period. To address the issue of waning vaccine-induced immunity, a second dose of vaccine has been suggested . We took into consideration this possibility by doubling the price of the considered live attenuated HZ vaccine to mimic a two-dose HZ vaccination policy. We found that HZ vaccination would still be cost-effective in the long run, even under the lower threshold of the ICER. Clearly, more work is needed in this direction, also in the light of the fact that some countries are currently considering replacing the live attenuated HZ vaccine with a new recombinant one [52, 53]. This new vaccine has recently been licenced by the US Food and Drug Administration and recommended for healthy adults aged 50 and above to prevent shingles and related complications . Although its reported high efficacy is expected to enhance the cost-effectiveness of the HZ vaccination, both alone and in combination with the varicella vaccine , the two-dose schedule and the high price might counterbalance the positive effects. Finally, our model assumed that the varicella vaccination was first administered to all newborn babies in Italy beginning in 2017, despite the vaccination having gradually been available in some regions since 2003. Considering that the coverage in these regions has reached moderate or high levels in recent years [56, 57], our results might underestimate the impact of varicella vaccination on VZV circulation in Italy and consequently overestimate varicella and HZ incidence, mostly in the short term . Our findings are especially relevant when considering the very recent changes in the Italian National Immunisation Plan (NIP) 2017–2019. The NIP 2017–2019 has introduced recommendations for six new additional vaccinations, which will be administered free of charge: four vaccinations targeted to infants and children (i.e. vaccines against rotavirus, varicella, group B meningococcal disease, and human papillomavirus for boys), and two to the elderly (i.e. vaccines against pneumococcal disease and herpes zoster). These recommendations have sparked a lively and heated debate on the appropriateness of the new childhood programmes and on the fact that varicella is one of the ten vaccines (hexavalent, plus measles, mumps, rubella, and varicella) that have been introduced as compulsory for school attendance (only starting from those born in 2017). So far, Italy has shown high regional heterogeneity regarding immunisation schedules and outcomes; thus, a new structured national plan will promise a better harmonisation in the vaccine offer and uptake. At the same time, the NIP requirements for school entry should ensure the achievement and maintenance of the high vaccination coverage rates that are necessary for the desired herd immunity effects. Our study has shown that the newly introduced combined varicella and HZ vaccination strategy in Italy is expected to be effective and cost-effective in reducing the burden of disease and the loss of quality of life. Moreover, the programme is expected to counterbalance the increasing trend in HZ incidence that is estimated in the absence of any vaccination programme and is thus purely due to demographic change. In particular, under the more realistic assumption of PI for the exogenous boosting, this decline would amount to around 435,000 undiscounted cases of varicella and more than 77,000 cases of HZ (and 81 HZ-related deaths) per year at a cost of 4375 EUR per QALY gained. We also found that an additional catch-up campaign for HZ vaccination targeting people aged 66–75 would further increase the benefits of the combined programme, leading to an additional reduction of 3542 cases of HZ and 6 HZ-related deaths per year, at a cost of 6829 EUR per QALY gained. Our work shows the importance of using models with non-stationary populations, in particular accounting for changing demography, when assessing the impact of vaccination policies on the epidemiology of those infectious diseases that are highly dependent on people mixing. This can surely provide a more thorough understanding of the expected outcomes and therefore help policy makers to design effective preventive strategies. We are grateful to Dr. Maria Gramegna and Alessandra Piatti from Regione Lombardia for providing us with the Hospital Discharge Register data on varicella and HZ for the Lombardy region. We also thank Prof. Giovanni Fattore and Carlo Federici from Bocconi University for the helpful discussions and for providing feedback on our work. We thank the reviewers for their very useful comments and suggestions. The research leading to these results has received funding from the European Research Council (ERC) under the European Union’s Seventh Framework Programme (FP7/2007–2013) and ERC Grant agreement number 283955 (DECIDE). The funder had no role in the design of the study, collection, analysis, or interpretation of data, or in writing the manuscript. All epidemiological and economic data used for the analysis are reported in Additional file 1 and in Tables 1 and 2 of the paper. AM, MT, and PP conceived the project. MT collected all data on economic parameters. VM, PP, and SM designed the computer model and carried out the computer simulations and analysis. EDF and AM designed the economic model. EDF performed the cost-effectiveness analysis. CR provided epidemiological expertise. AM, VM, and EDF drafted the manuscript. All authors commented on the drafts and contributed to the final version. AM is the guarantor of the study. All authors read and approved the final manuscript. PP has received personal fees from Merck & Co. Inc. for consultancy activity outside of the submitted work. All other authors declare that they have no competing interests. Human Mortality Database University of California, Berkeley (USA), and Max Planck Institute for Demographic Research (Germany) http://www.mortality.org. Accessed 3 May 2018. Database of the Italian Institute of Statistics. Italian National Institute of Statistics (ISTAT), Rome, Italy. http://demo.istat.it/. Accessed 3 May 2018.